Today I will be reviewing a product that I have been using for the past couple of months and it is called Lotus herbals skin whitening and brightening gel crème. Here I am not promoting the fairness product as I think no matter what your skin color is, it should look healthy. I bought this not for whitening but for the brightening purpose as I feel that these so called whitening crèmes and lotions are not what they claim to be. Okay, let’s get back to the review. 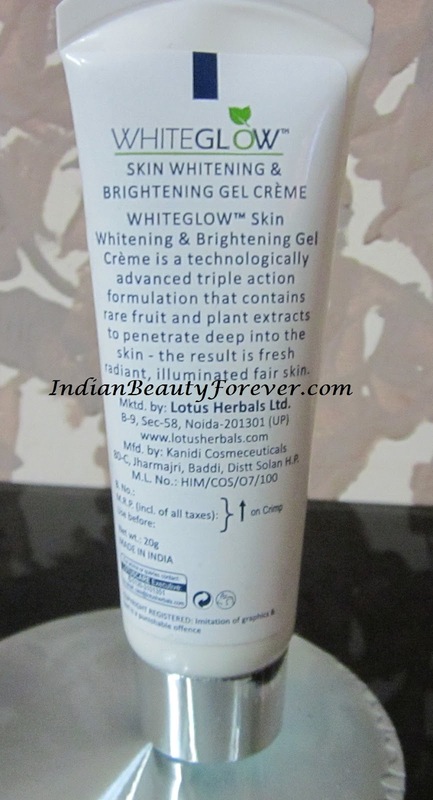 What the company claims- Lotus Herbals Skin Whitening & Brightening Gel Créme is enriched with Grape, Mulberry, Saxifraga extracts and Milk enzymes that are known fairness agents, A revolutionary formula that blends the benefits of a gel and a crème. It also contains sunscreens to protect the skin from harmful UVA&UVB rays that can darken the skin. My experience- I got about a couple of months ago, when this entire range was newly launched. I bought this gel crème along with the microemulsion. I have oily skin so that gel crème thing caught my attention. My sole aim was to use this product not for whitening but for brightening. I have oily skin and this gel crème does not make skin too oily or sticky. It has a nice consistency and texture. It absorbs quickly and does not give a white cast unlike most of the fairness creams. It also makes the skin glowy. This product has the goodness of grapes. Mulberry, saxifera extracts and milk enzymes. It says that it has SPF 25 and protects against the harmful UVA and UVB rays. I have used it for 3 months and have observed that it has visibly reduced the tanning and the pigmentation on my jaw line area to some extent. It cannot give you dramatic results as far the fairness claims are concerned however, you can expect atleast a shade lighter than before. Most importantly it did not break me out and my skin tone was also improved. 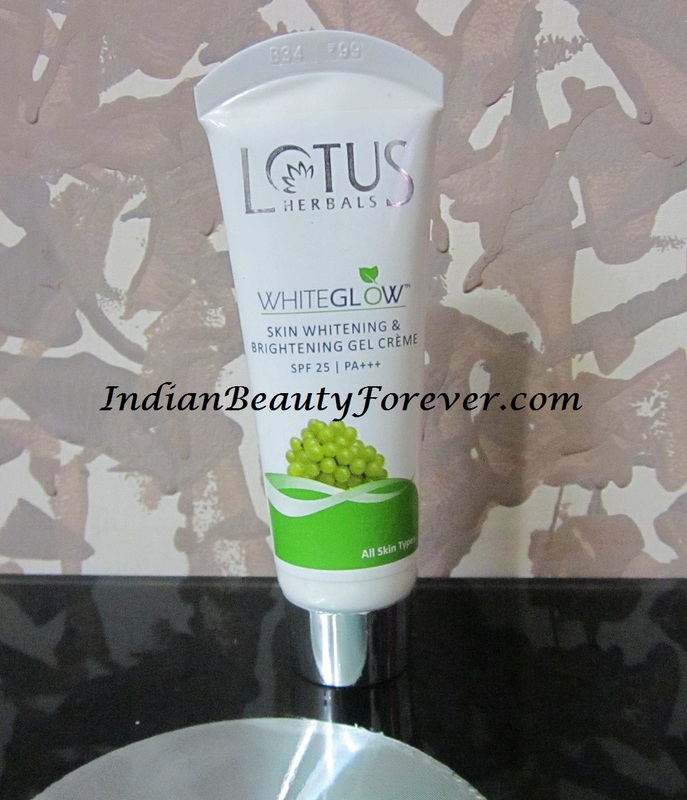 You can also see: Lotus Herbals Whiteglow Microemulsion Review from the same range. It is easily available and inexpensive. The gel crème formulation is suitable for oily skin. Tube packaging makes it hygienic while applying. Ingredients are mentioned on the outer packaging. It says that it has SPF 25 which is good as you are getting sunscreen and a brightening crème in one product. Texture and consistency is good. It gets absorb easily after a little massaging. It helps in improving the skin texture and tone. It has not broke me out which most of the crème does to my skin. Whitening claims are not appropriate, but it does brighten ups. Some of you who have excessive oily skin might find this sticky after some time. My take- Decent product at decent price. Do not expect much as per the fairness aspect but yes if you wish to get rid of tanning and wants to improve your skin tone and texture then try it! Did u eperience any burning sensation in your eyes while using this creme? i have not faced any such thing while using this, I actually had used two of them. have you checked the expiry ? i am using this cream since one week and, sorry to say i have lost my skin tone my skin has become darker when compared to before.. I think it does not suit you.. thats bad. I have used 2 of these so far and it does fine. Hope you get some good creme soon. I have oily skin too. It isn't that greasy so you can apply it and it shows results. You can also use some homemade ubtans to improve the complexion.